Finding a crack in your basement wall or floor can be disheartening and cause great anxiety. Immediately you start worrying about damaging water flooding the space and the cost of repairs. You can hire a professional to inspect it, but then you’re concerned about major remediation work he might recommend. How will you know when to start worrying? This comprehensive guide to foundation cracks will provide a concise synopsis of every type of crack that may plague your basement, the possible causes and what type of work will be necessary to correct it. 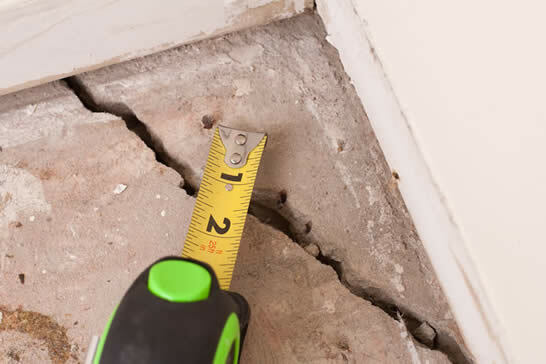 There are many types of foundation cracks that can occur, signaling some type of damage, but repair work will vary based on the type of foundation material plus the size, shape and location of the crack. It’s important to accurately determine the size of the crack. Measuring with a tape or ruler can be difficult for anything less than 1/4”. An easy reference is: 1/32” = width of a credit card, 1/16” = width of a nickel, 1/8” = width of two nickels. Now you’re ready to inspect and evaluate your own foundation to determine the best course of action. You’ll notice these are generally uniform in width or sometimes, less commonly, appear as V-shaped cracks. These will be wider at the top and get smaller as they travel vertically down the wall. They will range in length and will stop before reaching the bottom of the wall. Shrinkage cracks will appear under basement windows, above doors, at step-down areas and in the center of a long wall if control joints were not used. They’ll usually be less than 1/16-inch wide and show up as hairline, sporadic, random, and discontinuous cracks or a combination of all types in the wall. Shrinkage cracks almost always extend through the full depth of the foundation wall so may be a source of water entry. Shrinkage occurs as concrete cures, which is a chemical reaction and affected by the amount of water, aggregate type, humidity, groundwater, sun exposure, temperatures and other conditions. These cracks can be caused at original construction due to several factors, depending on the type of construction. As concrete shrinkage occurs, it will develop internal stresses. Cracking relieves this stress during curing. Poured concrete foundation walls – Shrinkage cracks can be caused by poor mix, rapid curing, improper or omitted steel reinforcement. Temperature swings consistent with the change of season can also cause the concrete to expand or contract to cause cracking. Block foundation walls – Shrinkage cracks are generally uniform in width, form at the center of the wall and are also caused by curing and temperature variations. Brick walls – While bricks are no longer used for present-day foundations, older buildings may still have structural brick walls in place to support the first floor. Brick walls don’t normally shrink but expand forever. 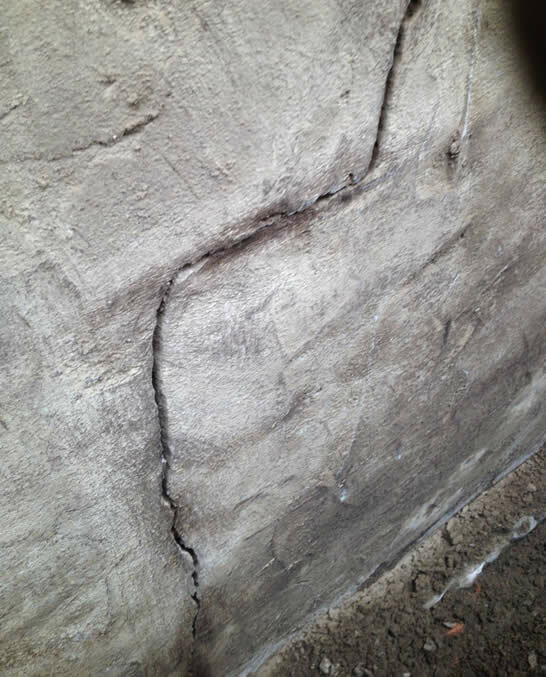 Shrinkage cracks usually don’t require any remediation work or structural monitoring in poured or block walls. You can expect to see more as the foundation dries completely. However, brick wall cracks will not be caused by shrinkage and may indicate a structural or support problem. Caution should be used if the bond courses are broken. There is a significant risk of wall collapse, so contact a professional immediately. Shrinkage cracks can be sealed to prevent water entry by chipping out the crack, filling with masonry patching compound, epoxy, polyurethane foam or other sealants. These are often present in poured walls, wider at the bottom and continue to increase in length and width. These will likely occur shortly after construction, extend down the entire length of the wall to the floor and possibly be the site of water infiltration. Settling cracks can increase in size to 1/4″ or more or stop completely. These are caused by foundation movement due to poorly prepared foundation footings, improperly placed or omitted steel reinforcement. Hydrostatic pressure from the sub-grade settlement, horizontal loading from the structure above and backfilling can also cause uneven stresses and lead to cracking. Hydrostatic pressure exerts force against the exterior foundation wall and becomes more severe further underground. While the majority of settling cracks display vertically, diagonal cracks may arise at a corner of a concrete wall where it was exposed to frost damage, expansive clay soil, point loads exceed the concrete mix used, or even a tree/shrub planted too close to the foundation wall. A diagonal crack under a ground floor window can be due to foundation heave indicative of shallow or absent footings. Cracks that appear anywhere else on the wall that are wider at the bottom than the top will indicate settlement under the building. These often show up in concrete block construction, and where they appear will determine the cause and severity. If they are located in the upper third of the block wall, they were likely caused by surface and subsurface frost or vehicle loading. Mid-wall height cracks are likely from damage by use of heavy equipment near the wall, premature or excessive backfilling before the floor framing was set, or earth loading worsened by water or frost. Low-wall height cracks are usually caused by earth loading and exacerbated in areas of wet or dense soil. Earth pressure is the strongest at the bottom of the wall and may deteriorate as the horizontal movement at the wall is pushed inwards. Block or brick walls will crack straight along a joint or stepped near the ends of the wall. This, too, can be extremely dangerous and risk collapse if wall courses are broken. In all cases, cracks will appear in multiples in various locations around the foundation. 16″ to 48″ from the top of the wall and run parallel to the floor. Ground conditions and material will dictate the type of repairs that are recommended to correct settling issues. The foundation must be stabilized and driven steel pins are one method of accomplishing this. Pins are driven into the soil next to the foundation and seated on bedrock. Shorter helical screw piers or friction piers can be used to prevent further settlement where there is no other support. Unstable soil conditions will warrant the use of rod and channel repairs. Threaded steel rods attach the damaged foundation to steel U-channels outside. Excavation and reconstruction may be necessary for extensive repairs. This type of work is generally combined with basement waterproofing and drainage components to prevent a recurrence of the problem. This may include correcting roof or surface runoff problems or installing a French drain system. 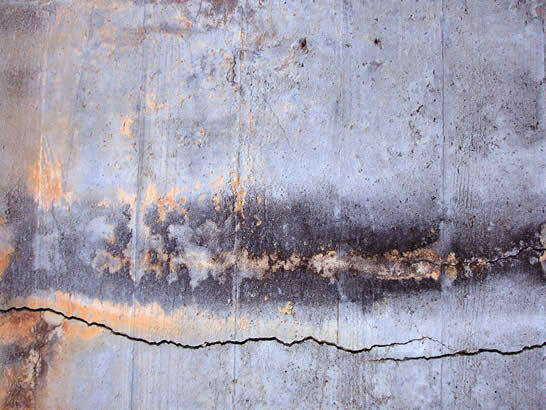 Severe settling cracks should never be sealed with caulk or epoxy without completing the necessary repairs. 1. Floating slab – Concrete is poured over level loose-fill dirt or gravel. As the soil is not generally compacted, there is a risk of cracking and settlement. Water runoff, flooding or leaks can seep under the building and cause settling. Any visible foundation cracks, however, will not affect the overall structural soundness of the building. 2. Supported slab – In this case, the edges of the floor rest on a lip in the concrete footing. The soil and gravel base are compacted. Soil settlement will have little effect on this type of pour as long as it has been reinforced; however, significant settling or improper reinforcement at pour can result in total collapse. 3. Slab on grade – This method is used when a monolithic slab and the building footers are poured at the same time. Cracks may be indicative of footing settlement and may be a structural concern. Adding control joints, if not included in the original construction, can reduce the stress of shrinkage. While cracks may still appear, they’ll likely be located within the joints and not across the floor. Non-structural cracks that are allowing water infiltration can be sealed with polyurethane foam injection. This will stop leaks and can be smoothed over and covered with a concrete sealer or paint to camouflage unsightly cracks. Mud jacking – This process is used to lift the concrete floor slab by pumping low-strength concrete (mud) underneath. Polyurethane resins can also be injected under the foundation. The combination of resins solidifies into plastic that contains gas bubbles. As it expands, the floor will be raised. This method is suitable as long as load-bearing rock or stable soils aren’t too deep. Grout Pumping/Slab Jacking – This method is used to raise interior concrete slabs on grade, monolithic concrete slabs or fill voids underneath the floor where bedrock or stable soils are deep. Thixotropic grout is injected under pressure to fill the void below the slab. French Drain System – When it’s determined that groundwater is flowing underneath the floor and eroding the soils away, a French drain system can be installed. A trench is cut around the interior perimeter of the basement where a PVC drain pipe is installed in gravel and connected to a sump pump to carry excess water safely away from the home. Some repairs will require excavation work which will entail the use of heavy equipment and exposing the foundation wall. While this will allow for a thorough inspection of the footings, walls, membrane and weeping tile, this is extremely dangerous and should be handled by a professional waterproofing company or contractor. Floor cracking can be symptomatic of a larger settling issue, and this extreme process may be the only recourse in fixing the problem. For those cracks, you’ve identified as needing repair, separate those in order of priority. Obviously, the most urgent are areas where there is a risk of collapse or unsafe conditions. For those less urgent spots, make sure to schedule remedial work in a short time frame as they will likely deteriorate quickly. A professional inspection should help in determining potential damage to the building and the timing of each repair. By taking a proactive approach to structural changes, including concrete wall and floor cracks, you may be able to avoid major repair work. Remember, any time you have questions or concerns about foundation cracks or waterproofing concerns, contact the experts at FamilyWaterproofing Solutions for more information.